Q8-DEWANIYA: Steve job's first magazine cover ! Steve job's first magazine cover ! 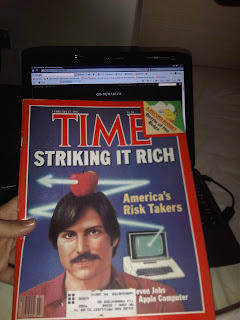 since i am a big fan of steve jobs (the co-founder and chief executive officer of Apple Inc.) yesterday aramex delivered my classic 1982 TIME magazine which i bought from ebay 1 week ago (a great deal by the way at $50) it is in amaizing condition. The article was about the bright young future brains of the future. You're a BIG fan of someone I don't know. Mashalla you know the (co-founder and chief executive officer of Apple)!!! law mo ohwa chan makoo apple! p.s tra it is worth it cuz he is steve jobs!